Is one of these two techniques: CO2 laser versus microdrill assisted stapedotomy results in better post-operative hearing outcome? To evaluate hearing results and outcome using two different surgical techniques (microdrill and CO2 Laser fenestration) in the treatment of conductive hearing loss in patients with otosclerosis. Retrospective audiometric database and chart review from January 2005 until December 2016. Seven-hundred forty-two primary stapedotomy have been reviewed retrospectively in two referral hospitals. 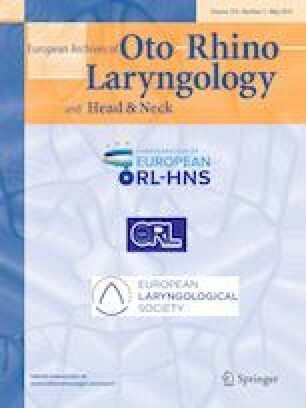 This multicenter study compared 424 patients operated for otosclerosis with microdrill technique and 318 patients operated with CO2 laser assisted stapedotomy. Preoperative and postoperative audiological assessment (following the recommendations of the Committee on Hearing and Equilibrium) were compared between the two groups at least 6 weeks and at 1 year or more. Measure of overclosure and hearing damage have been analyzed and compared between the groups. There were no statistically significant differences in demographic data between the two groups and no statistically significant difference in hearing outcome between the two groups. CO2 Laser with 0.4 piston showed slightly better results to close the air–bone gap postoperatively to ≤ 10 dB (84% as compared with the 80% of patients operated with microdrill technique). Patients operated with microdrill technique and 0.6 piston have less damage to hearing at 4 kHz. The use of CO2 laser seems associated with better postoperative air–bone gap closure. However, it carries more risk of hearing damage at 4 kHz at it is the case for the microdrill at 1 kHz. In general, postoperative hearing outcome using these two surgical techniques is comparable. We thank Pierre Pradat (Hôpital de la Croix Rousse, Hospices Civils de Lyon) for help in statistical analysis, and Philip Robinson (DRCI, Hospices Civils de Lyon) for help in manuscript preparation.